Globe-shaped roots have deep crimson skin, and reach 1.5" in diameter, without becoming hollow or pithy. Solid white flesh is firm, crisp and mild. Ready to harvest 29 days after seeding. GARDEN HINTS: Thrives in cool weather. 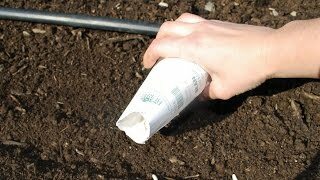 Make successive plantings every 2 weeks until late spring, then again a month before frost. Radish, Crimson Giant is rated 2.8 out of 5 by 5. 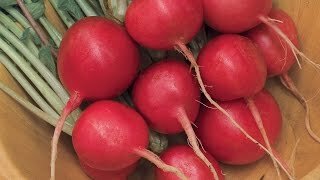 Rated 1 out of 5 by dlreimold from Very Disappointed I planted Crimson Giant radish seeds in late May in two different gardens located 6 miles apart.. Seed packet was purchased in May at regional retailer. Many seed stalks grew to over 2 feet high. However, the radishes were small, and in most cases, only produced a root. The few radishes that did form were very hard and extremely bitter. They were, in fact, not edible. The "mild white flesh" description on the seed packet can't be further from the truth. They should absolutely be discontinued from your inventory. Rated 1 out of 5 by zzzm from bad radish most of them just very tall very quickly and got flowers without ever producing a radish!!!!!!!!!!!! Rated 4 out of 5 by Crinum from Sturdy, but hot flavor This was my first attempt at radishes-- they grew up very nicely and the leaves and radishes themselves look spectacular. However, the flavor was much hotter than expected. Maybe this was due to growing conditions? At any rate I would definitely be willing to try these again. If you want an easy crop then try this! Rated 5 out of 5 by stamper from Super Radishes I have been growing radishes for many years, but this is the first year I have grown Crimson Giant. They are large, mild and up to an inch and three quarters in diameter, without being pithy. I will plant Crimson Giant from now on. Rated 3 out of 5 by raspberrybear from Radish haven PLants grew well and strong. Bolted and gave full and large seeds.